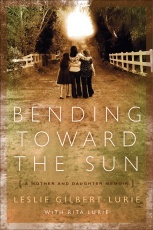 A miraculous lesson in courage and recovery, Bending Toward the Sun tells the story of a unique family bond forged in the wake of brutal terror. Weaving together the voices of three generations of women, Leslie Gilbert-Lurie and her mother, Rita Lurie, provide powerful -- and inspiring -- evidence of the resilience of the human spirit, relevant to every culture in every corner of the world. By turns unimaginably devastating and incredibly uplifting, this firsthand account of survival and psychological healing offers a strong, poignant message of hope in our own uncertain times. Decades later, Rita is a mother herself, the matriarch of a close-knit family in California. Yet in addition to love, Rita unknowingly passes to her children feelings of fear, apprehension, and guilt. Her daughter Leslie, an accomplished lawyer, media executive, and philanthropist, began probing the traumatic events of her mother’s childhood to discover how Rita's pain has affected not only Leslie's life and outlook but also Leslie's daughter's, Mikaela's. A decade-long collaboration between mother and daughter, Bending Toward the Sun reveals how deeply the Holocaust remains in the hearts and minds of survivors, influencing even the lives of their descendants. It also sheds light on the generational reach of any trauma, beyond the initial victim. Drawing on interviews with the other survivors and with the Polish family who hid five-year-old Rita, Leslie and Rita bring together the stories of three generations of women -- mother, daughter, and granddaughter -- to understand the legacy that unites, inspires, and haunts them all.